As a journal editor, are you tired of hearing the same excuses from authors who are facing allegations of problematic data? If so, you’re not alone. Recently, an editor of the journal Oncogene co-authored an editorial in the journal listing the types of excuses he often hears — and why none of them is valid. Writing the article with editor Justin Stebbing of Imperial College/Imperial Healthcare NHS Trust is David Sanders of Purdue University. Sanders himself has raised allegations of misconduct against a cancer researcher (and is currently being sued for defamation as a result). ‘Nothing to see here. Move along.’ This excuse comes from authors who can’t stop denying there are problems with their paper, even in the face of overwhelming evidence. ‘My dog ate the data.’ The “missing data” excuse makes more sense once a significant amount of time has passed since the paper was published, Stebbing and Sanders write. ‘If you look hard enough, you can find a trivial difference between two supposedly duplicated images.’ Um, not really, say Stebbing and Sanders — image processing can introduce artifacts, for instance. And even if there are minor differences, how can images with distinct origins be so similar? ‘It was the fault of a junior researcher.’ This could be true — but if so, why didn’t anyone else notice? ‘The responsible researcher is from another country and therefore unfamiliar with the standards expected in scientific publications.’ This excuse is “highly insulting” to researchers from other countries, Stebbing and Sanders note. And if the practices are so problematic, why didn’t the researcher’s supervisor school him or her on proper procedures? It appears that many journals are facing issues of problematic images and plagiarism. We wanted to assure editors at other journals that these are shared experiences and to fortify them in their confrontations with authors who engage in specious reasoning. Some researchers are product oriented. The ends justify the means. If overall the article is correct, the fact that details are flawed is irrelevant. The career reward system (grant funding, promotion, awards, etc.) favors productivity at all costs rather than solicitousness. If you have succeeded by ignoring the norms of scientific practice, you will minimize their importance. This attitude is problematic, because the details are critical in scientific endeavor. Control experiments ARE experiments and are therefore important. Furthermore, knowingly falsifying data undermines confidence in the scientific enterprise. The ends do not justify the means. Finally, researchers who are violating scientific norms are receiving resources that are thereby being denied to those who adhere to those norms. It is a natural expectation, for example, that authors have written the text of an article and have not recycled it from one of their own articles or from that of someone else. It is unfair to those who expend the effort to follow the rules to allow those who find it expedient to violate them to benefit from their infractions. Sanders has also raised concerns about other researchers’ work; he’s called for the retraction of a prominent paper in Science that suggests bacteria can live off of arsenic. Sanders declined to comment on whether his experience with sharing his concerns about data from other scientists — such as cancer researcher Carlo Croce, now suing him for defamation — had informed this list of responses from accused authors. He added that Oncogene, like many journals, adheres to the editorial guidelines established by the Committee on Publication Ethics (COPE). The journal has had to retract multiple papers — for instance, earlier this year, we covered a puzzling instance where researchers asked to retract a paper from the journal after correcting it, based on additional questions raised about the corrected images. Justin Stebbing as senior and corresponding author. Some journals require a supplement with untrimmed “raw” gel images. I love this for multiple reasons – it discourages the truly dishonest, it leaves a paper trail for those who do cheat, and it allows me to breathe a little easier about my own decades-long battles with entropy in data storage. I hope that as storage space because cheaper, all journals will require this. I believe you expect a technical fix for the human condition. It will unlikely reduce the need to be vigilant at all times. Georgios Giamas, University of Sussex, UK, as first author. Yes indeed! The requirement to post raw gel images, which adds essentially no significant burden to the authors, would greatly reduce the issues discussed most frequently on PubPeer. It would also reduce the burden on editors forced to address possible misconduct, and improve the integrity of and trust in the scientific literature. It’s a simple winning solution all around. Alternatively, the publishing houses might employ image editors, but that would make the publishing houses conflicted as it would eat into their more than healthy profits. The solution is going to cost the publishing houses either money, reputation, or both. Paul Brookes notes that he contacted the journal two years ago. Thus COPE guidelines indicate that an Expression of Concern should be issued. This editorial gives me some hope that we may yet see an Expression of Concern for this paper that has remained on the Advance Publication list for two years. While nothing is done to alert other researchers, this paper garners additional citations; the Oncogene web page suggests 3 other papers have cited this paper e.g. 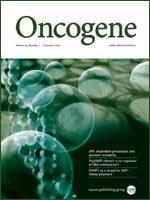 I am encouraged by this editorial that the editors will adhere to the COPE guidelines that Oncogene purports to support, and issue an Expression of Concern for this paper containing dubious evidence from a lab known to have considerable problems with such issues over many years, with other retracted and Expression of Concern papers. Eight weeks after reading the editorial, and writing to Justin Stebbing about issuing an Expression of Concern for article doi: 10.1038/onc.2014.440 showing problematic images, I have heard nothing. Sadly the editorial referenced above has been all show and no substance. Meanwhile, the Oncogene website now suggests four citations for this problematic paper, which still sits unpublished and without an EoC three years after submission. As a journal author, are you tired of seeing the same excuses from editors who are facing allegations of problematic data? If so, you are not alone.